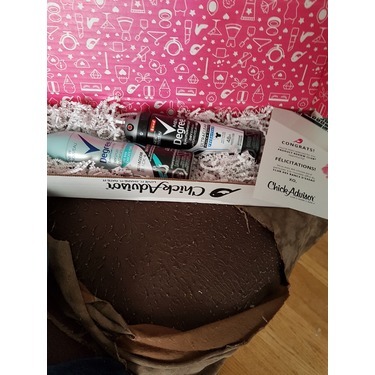 I received this product for free and it was my first time trying it. 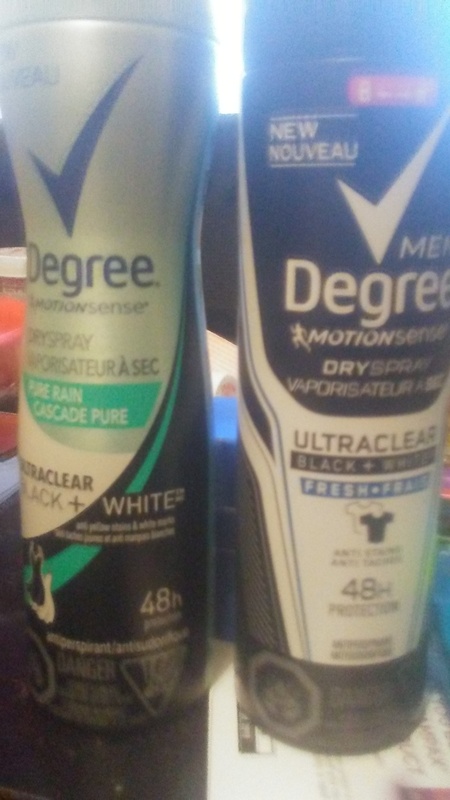 I have noticed if you spray it too close to black clothes it will leave white marks on them, The scent is amazing, I love it. 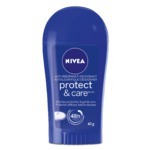 I would recommend this product as it does work good and kept me dry. Just don't spray too close to black clothes. Overall great product. I doubt I will go back to roll on antiperspirant after using this product. 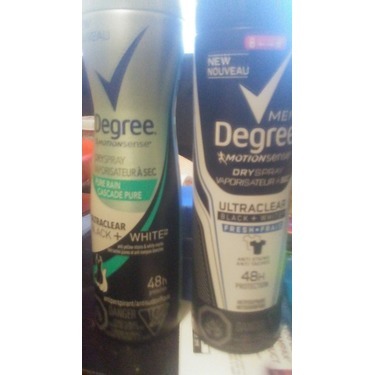 The instant dryness is amazing and there was no staining on my clothes. I like that there are a range of scent options and that they are not overwhelming. Performed great even during high intensity cardio workouts. Would reccomend this product to anyone. 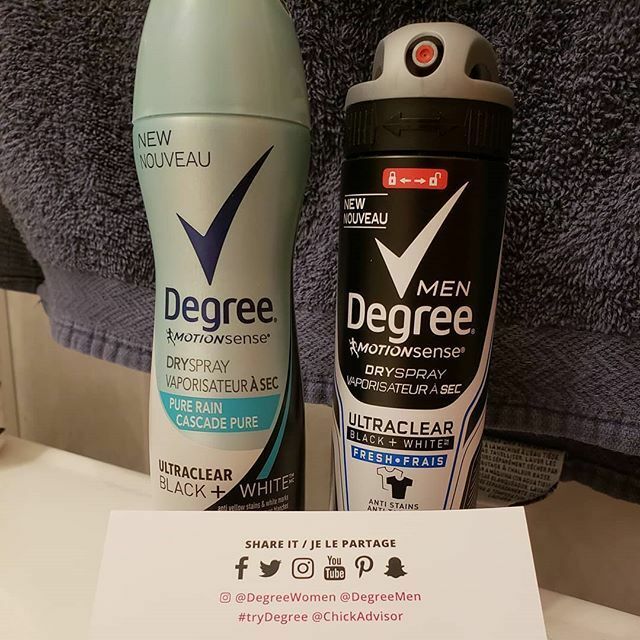 We received the Degree Women's Ultraclear Black & White Fresh Dry Spray for free inexchange for our unbias review. The product goes on so dry that I was unsure if it really went on - the product does work very effectively and has a great smell. So far, so good with regards to the white shirts not turning yellow under the arms. I would recommend this product to family/friends. 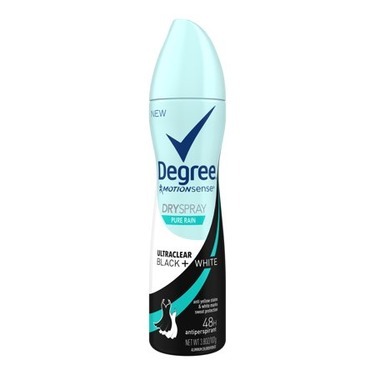 I have now changed my go to deodorant - this product is amazing. My only critisim is that the button is quite hard to press with long nails - it needs a bit of pressure applied. Reçu pour tester, par chikadvisor, j'ai découvert un produit super, d'habitude les antisudorifique, colle, laisse des traces, ou ne stop pas l'odeur. Degree, est effectivement sec,son agréable surtout pendant la course a pied ou marche. Utiliser sur plusieurs couleurs... aucune trace! Le parfum est moins envoûtant que le version homme, l'apparence plus fine ce qui n'est pas mauvais en soi plus féminine. Degré aérosol est une découverte donc que maintenant je ne pourrais plus me passer de ce produit qui à une efficacité et de plus une odeur tellement agréable. J'ai eu la chance de tester ce produit gratuitement et maintenant c'est garanti que c'est mon produit préféré. 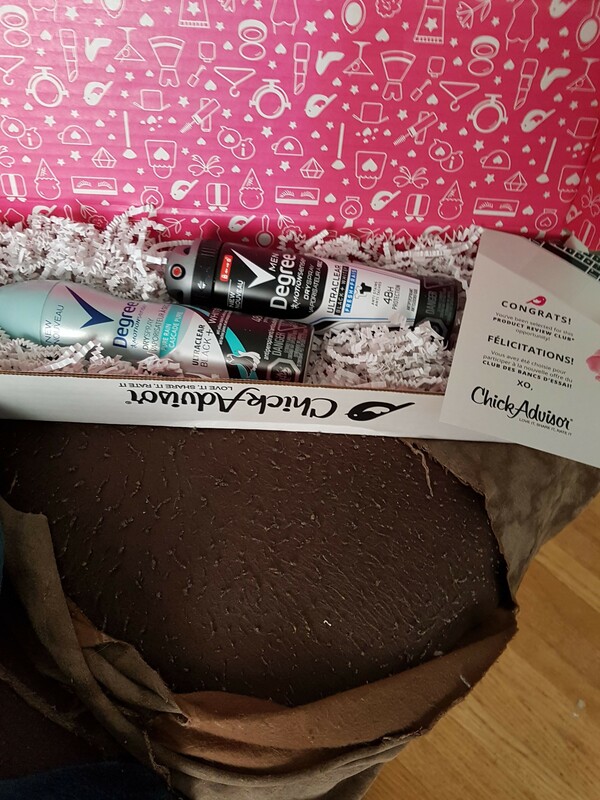 Merci ChickAdvisor. j'ai adorer ce produits. Il est facile a appliquer et il a un bon parfum. Il tien bien toute la journée sans qu'on s’inquiète de cela. et de tout les vêtements que j'ai mis en essaillant ce produits, rien n'a été tacher. Je l'ai adorer. Wouldnt buy the other kinds now! 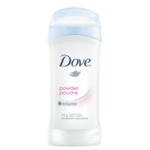 I love this dry spray antiperspirant! 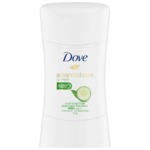 I switched over to using dry spray antiperspirants last year, and I have tried a few thus far. 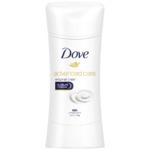 This one is great - it smells great and does not stain my clothes like most antiperspirants do. I definitely recommend this to anyone looking to try their first dry spray or anyone who is looking for a new dry spray! First time trying this and I wasn't disappointed. I've got sensitive skin and sweat a lot. Not only that it did it job well as deo and antiperspirant but also last throughout the day. Didnt leave any yellow marks or white stains on shirts or powdery clumps on your underarms.